Want to know what I think the next BIG wave will be in this crazy entrepreneurial world we all reside in? and let’s not forget LinkedIn – which let’s face it is really boring but it has it’s uses. It’s hard to know where we should be focussing our efforts next year isn’t it? But what if I tell you it’s NONE of the above. Is there a new social media platform coming out that we don’t know about? As you know I go to a lot of Media and Social Media conferences. I test things out in my own business. I live and breathe marketing and keep up to date with all the latest news and technology. And there’s ONE THING that people are doing NOW that outshines everything else. Facebook Pages are gathering dust. LinkedIn recommendations are great to make you look good but don’t really drum up any business. We have thousands of followers on Twitter but none of them buy from us. Over on Instagram we are massively popular but does it transfer into cash? 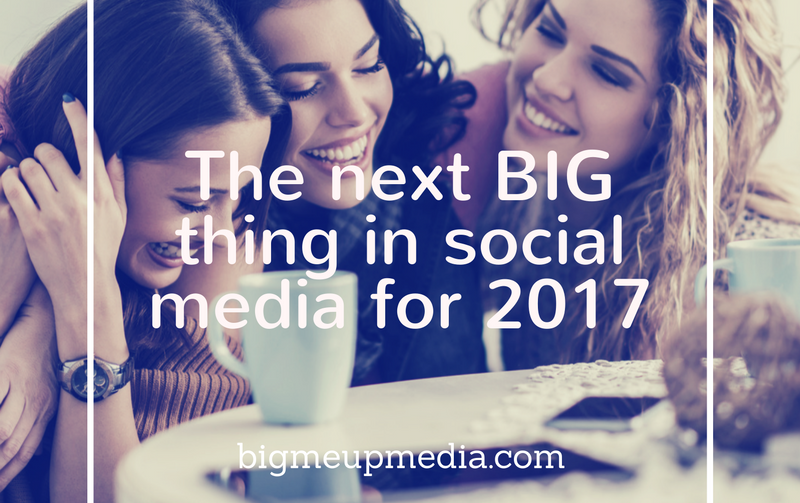 This NEW TREND that I predict will be MASSIVE in 2017 is part of my new Group Mentoring Course – we have integrated it in. In fact it was a driving force behind the whole project. This NEW TREND has been used all this year by myself and my clients to great effect culminating in even more income. This NEW TREND is far more powerful than social media alone. Once you know, I want you to use it. Don’t just save the information and do nothing. Take all your people ONLINE – the ones in your Facebook Groups, the fans on your Pages, the ones who follow you on Twitter, like your pictures on Instagram and endorse you on LinkedIn. Invite them to MEET UP with you in person. Taking your online world OFFLINE I believe is set to be the biggest trend next year. People are TIRED of hiding behind their computer screens – they want real interaction with real people again. They want to chat and banter and share a glass of wine, relax and goose around, share what’s working and what’s not. Feel like you’re not the only one in the world going through whatever it is you are going through and knowing there’s a bunch of other guys who feel as crappy as you do. It makes us all feel instantly better! Utilise that amazing fan base you have created and hold an EVENT or a WORKSHOP. Invite them to jump on the phone with you – I guarantee you will see higher conversion rates than any sales funnel you come up with. I bet you don’t even have to pitch to them. They will just ASK if they can work with you. And if like me, you are creating a NEW ONLINE PROGRAM for next year make sure it has REGULAR MEET UPS and LIVE Q&A’s built into it. It’s going to be an exciting year and I can’t wait to tell you all about the Dream Life Academy. I am taking just 40 people on this year long program designed to grow their business in 2017. Doors only open ONCE A YEAR. I already have 30 people on a HOT LIST and they get first dibs but after that I am releasing it to EVERYONE on Wednesday. So if you, like me, desire a DIFFERENT way to do business next year then keep an eye on your email on Wednesday and you could be one of the 40 to try something new and exciting in 2017 to finally start developing your business and your dream life.